2014 Mercedes E400 Coupe AMG Sport Plus | What Car? The new Mercedes E400 Coupe AMG Sport Plus is a quieter and less furious version of a fictional E63 Coupe. You see, Mercedes doesn’t fit its 5.5-litre twin-turbo V8 into the E-Class Coupe (only to the saloon and estate versions), so the 329bhp, twin-turbo 3.0-litre V6 E400 is the most performance-oriented version you can buy. 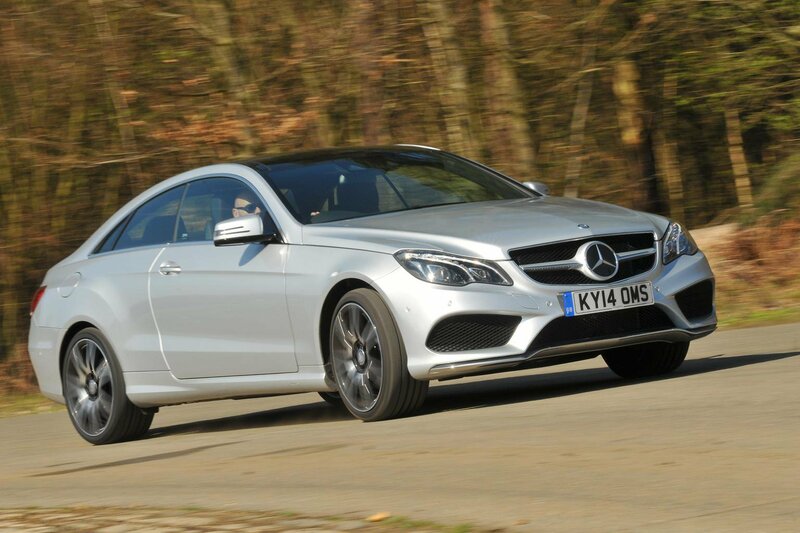 What’s the 2014 Mercedes E400 Coupe AMG Sport Plus like to drive? Seriously rapid. The engine is smooth and quiet, and builds speed progressively from very low revs, resulting in an almost surreal lack of drama to the way it tears up the road. The standard seven-speed automatic gearbox does a great job, blurring shifts well in normal cruising, and responding sharply to a flick of the steering wheel-mounted paddles. It can hesitate a moment too long if you want immediate acceleration, but only rarely. However, while it’s faintly shocking how quick it is (it’s just 0.1sec slower than the BMW 435i Auto to 62mph), the E400 never feels like a sports car. The steering is quick, making the car feel darty when you turn in to a corner, but you’re always conscious of its weight, and while the steering is quick, it’s a touch too light and inconsistent in its responses to really fill you with confidence. Unfortunately the ride (which is firmer than on non-AMG spec Coupes) is too sharp over bigger bumps. Potholes and expansion joints can have it jarring harshly, and can also make it skip momentarily across the road if hit mid-corner, although it does cope well enough over less heavily scarred road surfaces. What’s the 2014 Mercedes E400 Coupe AMG Sport Plus like inside? There's plenty of head- and legroom in the front seats, which are comfortable and easy to adjust using the standard electric controls. The steering wheel benefits from a good range of adjustment, too, and the E400 gets the full AMG styling kit (inside and out), so you get styling tweaks including red stitching on the leather sports seats and even red seatbelts. Things aren't so impressive in the rear. Shoulder room is okay and the seats themselves are comfortable, but there isn't enough head- or legroom to accommodate anyone approaching six-feet tall on long journeys. That said, the same goes for the BMW 4 Series. Boot space is roughly on a par with that of the 4 Series, too, and the load bay is a nice square shape. However, the small, saloon-style opening obstructs bulky items. You don’t need to add anything to the generously equipped E400 Coupe. Seven-inch colour screen, sat-nav, a DAB radio, Bluetooth, a USB socket, iPhone connection, 14-speaker sound system, leather seats, front and rear parking sensors, keyless entry and start, automatic lights and wipers and 19-inch alloys are all included. The Mercedes E400 Coupe AMG Sport Plus is a sumptuously refined and rapid cruiser that handles with enough balance and communication to satisfy anyone looking for a sporting GT. However, it’s a tad expensive, even taking into account the extra kit it gets over rivals such as the BMW 435i, which is also more fun to drive and more comfortable.